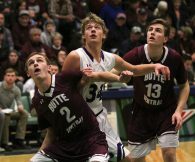 What will be the lasting image of Thursday night’s Butte High-Butte Central boys’ basketball game at the Butte Civic Center? 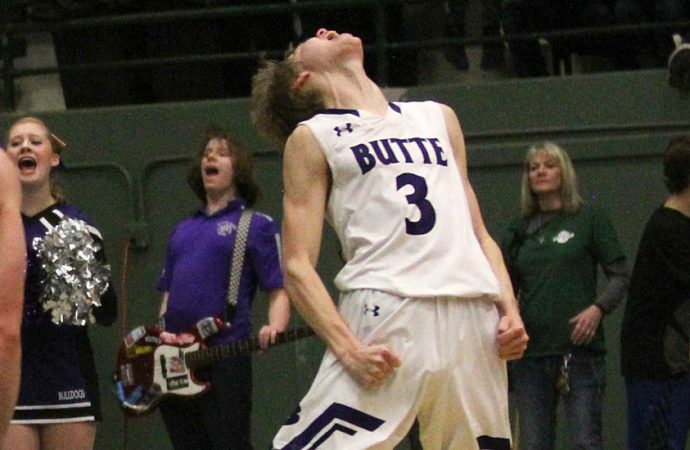 Will it be Butte High’s Clay Ferguson flexing and screaming at the ceiling after breaking a tie game with 2.8 seconds left? 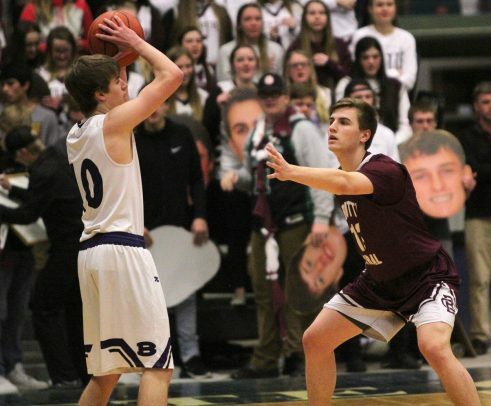 Will it be Cade Holter shooshing the Butte High student section after hitting an improbable shot from behind the half-court line to send the game to overtime? Will it be the Bulldogs posing for photos with their fans after what was by far the most exciting and intense game of the season? Will it be the postgame somberness of the Maroons, who forced the extra 4 minutes after trailing by 15 points in the first half? 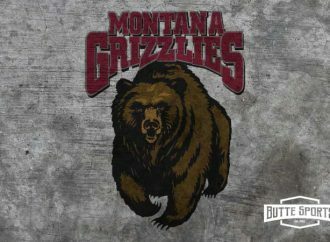 However you remember the latest chapter of Butte’s big game, it will be a memory that will likely last with you for a lifetime. In a series full of classic games, Thursday’s very well could have been the best. It is at least in the conversation. 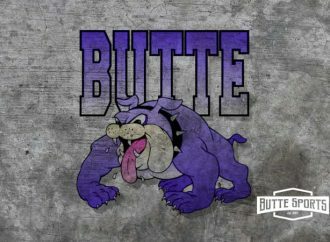 The Butte High Bulldogs left the storied arena with a 61-57 overtime win over the Butte Central Maroons in a contest that most of the 3,000 or so spectators could sum up with one word. Wow. The extra stanza came after a few heart-stopping momentum swings at the end of regulation. The Maroons tied the game at 48 — the game’s first tie — with an NBA 3-pointer by Luke Heaphy with 14 seconds left. The Bulldogs countered when Kash Kelly hit Tommy Mellott, who hit Ferguson for bucket and a foul to make it 51-48 with 2.8 seconds left. Cade Holter then pulled off the shot of a lifetime, hitting the more-than half-court prayer from near the sideline as the buzzer sounded. It was nothing but net, and the BC players and bench stormed the court. 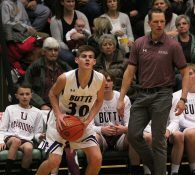 Holter said he told Butte Central coach Brodie Kelly that he wanted to take the shot. “It felt good as soon as it left my hands,” he said. BC’s feeling of exuberance, however, didn’t last because Butte High never trailed in overtime. Count Butte High coach Luke Powers as one who begs to differ. Powers said that Thursday’s battle will be a springboard for his Bulldogs, and Holter’s shot was a major part of that. “Now, I mean hindsight’s obviously 20/20, I’m glad that he made it because we had to respond again,” Powers said. “We had to make free throws down the stretch. We had to attack. We had to take care of the ball against an incredible defensive basketball team. 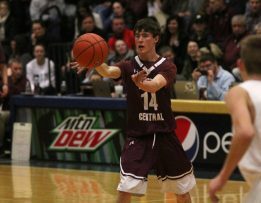 Danny McCloskey, who lead Butte Central in scoring in last year’s Butte-Central game, hit a pair of free throws to open the overtime period and give the Bulldogs the lead. Sophomore post Jake Olson then sank a hook-shot to make it a 55-51 Bulldog advantage. The cushion was enough for the Bulldogs to hold on for the win. But it never felt like it would end. Two more free throws by McCloskey with 58 seconds left extended Butte High’s lead to 58-52. Maroon Dylan Sestrich hit a bucket before Butte High’s Tommy Mellott hit one of two free throws for a 59-54 lead with 42.1 seconds left. BC junior post player Aaron Richards drew a foul on a 3-point shot with 17.5 seconds left, and he sank all three free throws. That cut the lead to 59-57. Trevyn Roth, though, iced the win by hitting two free tosses with 14. Seconds on the clock. “No. 1, and I think first and foremost, no one deserved to lose that game,” Powers said. “The Butte Central kids didn’t deserve to lost that game. Butte High kids didn’t deserve to lose that game. The win snapped a six-game losing streak for the Bulldogs (3-11), who have four conference games left before heading to the Eastern AA Divisional tournament in Great Falls. Butte High is hoping the game puts an end to a streak filled with disappointment and sickness. Late Wednesday, Powers said some of his Bulldogs were so sick that he thought for sure Ferguson and Roth wouldn’t play. He thought Kelly was a question mark. The players, though, knew otherwise. The Maroons fell to 14-3 with their third loss in four games. Holter echoed his coach, downplaying the significance of losing to the rival Bulldogs. “I don’t think it will sting for my whole life. I’m already over it,” Holter said. “There’s a lot more season left. There’s bigger things we can do. The Maroons definitely have bigger things ahead, like Saturday. BC will play host to Corvallis at the Maroon Activities Center. A Central win will give the Maroons a bye in next week’s district tournament. Keeping things in perspective when it comes to the Bulldogs and Maroons, however, has never been a strong suit in the Mining City. Fans will be talking about this game for a long time. The way it started, the talk was that of bewilderment. 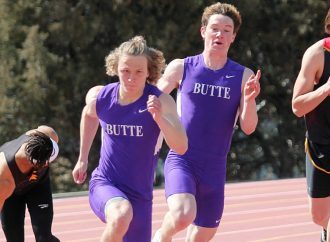 Butte High came out fast, and turned up the heat on a BC team that had to be the favorite heading in. After Holter scored on an inside hoop to start the game, Ferguson and Roth hit 3-pointers to give the Bulldogs the lead. Butte High led 14-13 after Sestrich took a pass from Heaphy and sank a 3-pointer to open the second quarter. Butte High, though, scored 16 of the game’s next 18 points to take a 30-15 lead. Central, which trailed 30-18 at the half, kept chipping and chipping away at the lead until Heaphy sank the 3-pointer. Butte High’s apparent game-winning play at the end regulation was the result of learning from a past mistake. Roth, who hit four 3-poitners, joined McCloskey with 14 points. Ferguson tossed in 12, while Kelly scored 11. The Bulldogs got four points and some crucial rebounds down the stretch by the 6-foot-6 Olson. Kale McCarthy and Mellott each scored three. Jake Vetter also played for the Bulldogs. Holter’s 14 points led the Maroons. Sestrich, who sank three 3-poitners scored 12. Braden Harrington tossed in nine, and Richards scored seven. All nine BC players who hit the court scored points. Gator Yelenich scored five, Heaphy and Tervor Neumann scored three, and Jared and Matt Simkins each tossed in two. Ferguson said he thinks the win did just that for the Bulldogs. The game marked the 10th time the Bulldogs and Maroons needed overtime to decide the game. Four of those games went to double overtime, including Butte High win in 2010 and 2015. 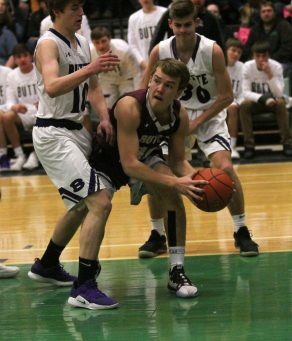 BUTTE CENTRAL (14-3) — Luke Heaphy 1 0-0 3, Matt Simkins 1 0-2 2, Braden Harrington 3 1-2 9, Dylan Sestrich 4 1-2 12, Cade Holter 6 1-1 14, Jared Simkins 0 2-2 2, Aaron Richards 2 3-4 8, Gator Yelenich 2 0-0 5, Trevor Neumann 1 0-0 3. Totals 20 8-13 57. BUTTE HIGH (3-11) — Kash Kelly 3 4-4 11, Clay Ferguson 3 5-7 12, Kale McCarthy 1 1-2 3, Danny McCloskey 3 7-11 14, Trevyn Roth 4 2-2 14, Tommy Mellott 1 1-2 3, Jake Olson 2 0-2 4, Jake Vetter 0 0-0 0. Totals 17 20-30 61. 3-point goals — BC 9 (Sestrich 3, Harrington 2, Heaphy, Yelenich, Neumann, Holter), Butte 7 (Roth 4, Kelly, Ferguson, McCloskey). 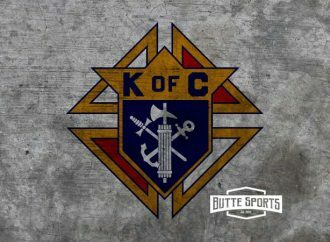 Fouls — BC 26, Butte 13. Fouled out — Sestrich, M. Simkins.